Summer is over (sob!) but we’re not prepared to rock the pasty look yet. Similarly we don’t want to look like an Oompa Loompa in October, but a casual fake tan glow would be nice. I first tried this tan when I got it for my 21st birthday…which was a few years ago (OK, a decade) so it’s been around a while. And for a reason – it does exactly what it says on the tin. It’s a brown mousse so you can see exactly where it’s going. I use plastic gloves to put it on. Back in the day, my gran gave me a box of them that her carer used (RIP Granny G), but you can buy them too. It’s dead easy to put on and rubs in easily and you can see where you’ve missed. You leave it on for four hours and let it develop and wash it off. In my younger (and more stupid) years I’d just leave it on to go out in, so I was David Dickinson-level brown and wash it off the next day. This probs isn’t recommended as you can get yourself into a mishap when it starts to chuck it down and you also have no coat. (Is it obvious I’m northern?!). I really like this tan, it does make you smell of digestives (but I quite like that), it lasts ages and looks good. And it normally lasts about a week or two before I go for another layer! Biscuit smell: **** You’ll want to dip your arm in a cuppa. I’ll be honest, I’m not a massive fan of gradual tan. It’s more faff as you have to do it more often to get to a good tan level. But if you’re wary of tanning and don’t wanna go full Beyoncé, I’d say this is the way to go. I’d heard lots about this brand recently as it’s all organic and the new cool luxury brand. The name reminds me of Liberace though, so I feel like it should come with some glitter and show tunes. Fortunately it’s classier than that. It’s a white cream that goes on like moisturiser, a big tick there. It was so easy to put on and dry. You had to slap a lot on to get some coverage though so I don’t think it would last me long but I was impressed with the result, a nice subtle glow. I think this would be great if you have some colour already and your skin is looking a bit dull or your real tan is fading. This one comes with a mitt and gloves, excellent! Though the black plastic gloves look pretty sinister. It’s a spray which you spray onto a mitt then rub in. Don’t be fooled thinking the mitt will protect your hands. I learnt the hard way, it doesn’t. You need the scary gloves. This goes on nicely, and it’s brown so you can see where it goes. The guide tells you how long to keep it on for. depending how dark you want to go. It develops, you wash it off and voila! A lush even tan, hurrah. This is my fave of the bunch. (Keep reading though, the funny bit is coming). 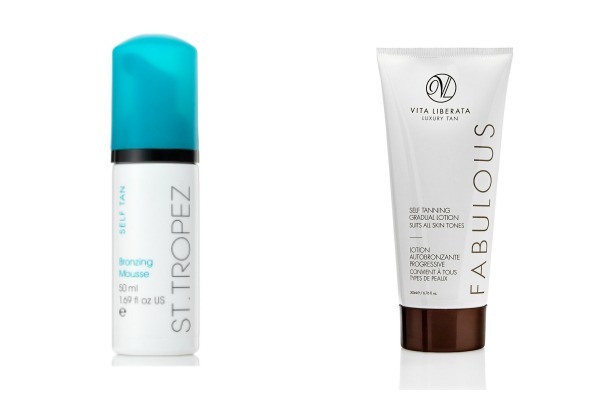 I like the St Tropez mousse, so I had high hopes for the gradual tanning. This is an in-shower one, so they bang on about it being dead easy to use. That is unless you have the coordination of a zombie on marijuana. So I get in the shower, wash normally, then turn off the shower and apply the cream. It’s really weird as it’s all silky, which is odd on wet skin. I can’t see what I’m doing to get it on my back. Next the instructions say wait three minutes. THREE WHOLE MINUTES standing doing nowt. I don’t have a clock in the bathroom and I’m bored, so I get out and check on what I’m cooking in the oven. Then I pop back in the shower to wash off. Except it’s so bloody slippy I can barely stand up and getting this off is a mission, it’s like silky glue. Oh and whilst they say wash off after 3 minutes, in the next sentence they say DON’T leave on longer than 3 minutes?! What the actual chuff. I frantically wash it off and I make it out unscathed. After all that palaver I have a tinge of tan and some patches. And some on my floor. Well that was fun. So, I actually thought this was a fake tan on a mitt or something singing and dancing, but it’s just a mitt. That said, it’s So. Frigging. Good. Before I put fake tan on it I kept smushing it in my face as it was so soft. Like puppy-level soft. It’s velour and double-sided like an oven mitt and helps you do your back – hence the awesome pun in the name. And it has some sort of protective film inside so you don’t even have to wear gloves, whoop! And it’s washable too! 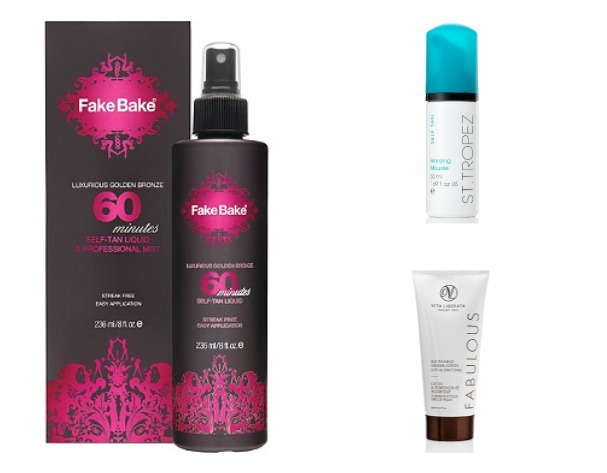 What are your top fake tan products? Let us know – @tweetjanes.